Awful Arthur's opened our Salem location in June 2005, and ever since then we've been striving to bring the best service, food and entertainment for all of Salem to enjoy. We are located at 1302 West Main street, Salem VA. Here at Awful Arthur's Salem we provide a large non-smoking dining area with the most delightful dishes from the sea, cooked by our wonderful chefs, and the kids can enjoy the sights of the sea in our wall sized aqaurium. 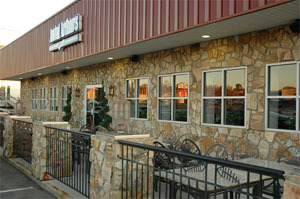 If eating outside is your thing than we offer plenty of outdoor seating. Then after dinner retire for the evening in our huge bar area consisting of 4 wall sized big screens and a dozen or so more large TV's for all your sports viewing pleasure. In our lounge we also have 5 pool tables which are free during our Awful Hours(11-7), so come in before 7 and play for free with a purchase of lunch or alcohol. If darts are your game of choice try our dart lanes which are always free. Trivia buffs we offer the NTN trivia. Come and test your knowledge against the best players across the country. Lastly, our bar boasts having the longest bar in Salem so we have a ton of room for you and all your friends. While your relaxing at the bar you'll have the opportunity to hear the some of the best local and regional music available in Salem. We offer free live entertainment every Thursday night, and then our weekends are full of good times with entertainment for a smal cover. Check our calendar for updates on who is coming. Review: Hi this is Natalie Wiley the General Manager of Awful Arthur's Salem. Everything they have said here is true. We would love to have you come check us out! Mention this review and get a Pirates Gold card on me! See you there.